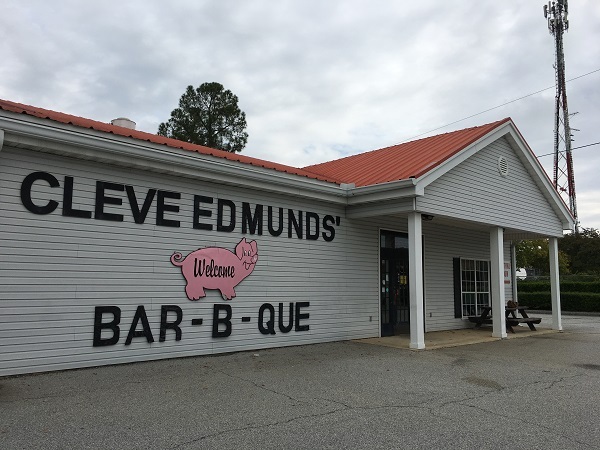 Cleve Edmunds Bar-B-Que, Augusta GA – Marie, Let's Eat! It had only been about three months since I had some barbecue in Georgia. (It had only been about twenty-four hours since I had barbecue at the Skylight Inn, but that’s not relevant right now.) I’d been hoping to find great barbecue in Tennessee and had been failing so spectacularly that I couldn’t wait to get some good Georgia barbecue again, and this delightful old place did not let me down. Okay, so I’m full of hyperbole, but indulge me. When we moved to Chattanooga, I had hoped that our little explorations would find many unheralded discoveries and really neat treasures in eastern Tennessee. By the time we took this trip, they had not. What we’ve chosen to write about has been pretty good. What we’ve decided against writing about has been pretty terrible. The best we had found, Sportsman’s, is pretty solid, but if I started listing places in Georgia that I enjoy more, we’d be here all day. In Nashville, we had great ribs at Peg Leg Porker. In Knoxville, Sweet P’s is also really good. Every place else at best satisfies; nothing thrills. Spoiler alert: Things would improve when we got back home. More about that next week. 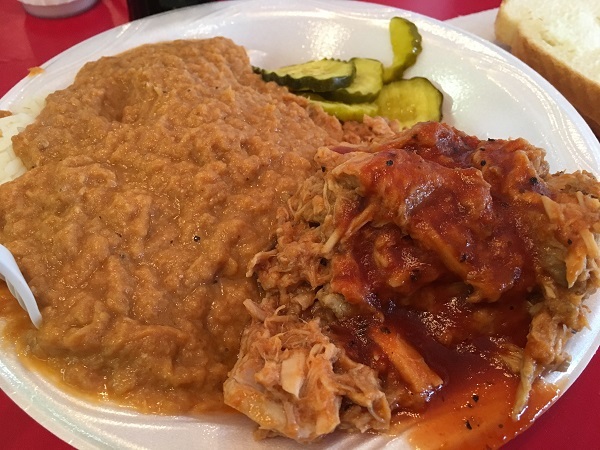 So we went to the Carolinas, and found fantastic barbecue where we knew we would get it. Stamey’s and Skylight Inn were already favorites; Stephenson’s and Sweatman’s made me punch the air. And so back to Georgia, where we had three new-to-us barbecue restaurants on the itinerary. I’ve preached and praised and insisted that Georgia’s barbecue is far, far better than anybody out-of-state knows. Surely my home state wouldn’t let me down. Surely we’d have some barbecue that’s far, far better than what we’ve found in eastern Tennessee. We did. Far, far better. Cleve Edmunds opened this restaurant in 1976, but the business dates back to 1949. His father Barrett had sold barbecue and a mustard-based sauce in Belvedere and North Augusta throughout the 1950s and 1960s. Cleve started a restaurant in 1966 and this location was, briefly, the second of two, but two factors apparently surprised him. First, it was considerably more popular than he had expected, and he was selling way more in Georgia than he had been in South Carolina. Secondly, he quickly had to come up with a new sauce. We’ve talked a lot about barbecue sauces in this blog, and generally find that there are few hard and fast rules or battle lines where one sauce is extremely popular in one county and not at all in its neighbor. A probable exception: the Savannah River divides Augusta from several suburbs in South Carolina. There, mustard-based sauces are what people want, and in Georgia, it’s tomato-based. You can see this in some places today like BBQ Barn in North Augusta, where the two sauces are labeled Georgia Red and Carolina Gold. Edmunds passed away in 2008, and the business is now run by his wife Maxanne and stepson Stephan Allmond. The original store in South Carolina has been closed for decades; most of their guests today only know this establishment. I’m surprised at myself for never visiting before, but we’ve always done a pretty weak job in covering Augusta. It’s an extremely popular restaurant, open seven days a week, and the food is terrific. We arrived a few minutes before they opened and our son decided (correctly) that we all needed to get some exercise in the parking lot while we waited. We had the restaurant to ourselves that morning, and really enjoyed talking with the two people working. Marie and I each had a pork plate with hash and rice. This is one of those places in eastern Georgia that give you a metric ton of hash. It’s delicious. The pork is so smoky and moist. We forgot to ask for the meat dry, but didn’t object at all to the sauce. We were a little disappointed that our son, who only asked for some rice as a side, managed to scatter it everywhere, as five year-olds do, and apologized for the mess. I arrived with high hopes and this place met them. We never did Augusta justice at this blog, and never spent a day here, eating at five or six different places. We probably would have visited this place before now if we had; we missed out, but this was exactly what my jaded mind needed, a strong reminder that Georgia’s barbecue is reliably better than eastern Tennessee’s. And there was better yet to come. Posted on December 5, 2016 by Grant G.Posted in augusta, barbecue, georgiaTagged augusta, barbecue, georgia, hash and rice. You were down the road from me! Glad you enjoyed it. My favorite in the area is Carolina BBQ in New Ellenton, SC. Thank you for the recommendation! I hope that we’ll come back to SC in 2017. I’d like to take our son back to EdVenture and do a really good job eating in that area. Hopefully finances will allow it.